Felt like I needed to do some kind of 2004 wrap-up so I figured how about music. Bought a lot of music this year over previous years all because I can get individual songs now at the iTunes Music Store. I find myself buying 1 or 2 songs that I like off of completely random albums that I would be embarrassed to buy in person at a store. 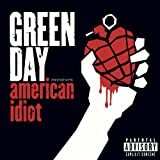 This year my favorite album is Green Day’s American Idiot. The last time Green Day hit the album of the year for me was probably in 1994 with Dookie. I have bought every Green Day album in between but arguably they were all very similar. Short punk rock songs with similar sounds. Nothing bad about them, just didn’t rise to the top. This new album has some much fresher sounds, a good mix of tracks, and a great 9 minute song — yes, a 9 minute song from Green Day. Anyway, that is my choice.